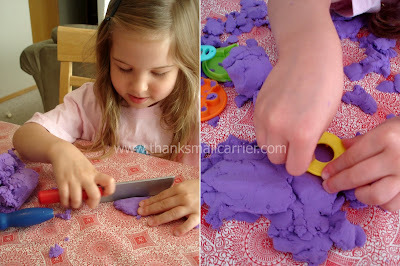 This seems like something that I shouldn't admit, but I really dislike letting my kids play with clay and dough and nearly always say no when they ask. When it comes to finding a solution to my issues, there didn't seem to be one. 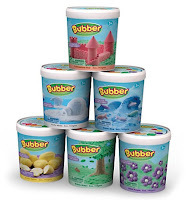 Fortunately, to save my girls from being destined to miss out on the creativity and fun of using their imaginations and hands, we were introduced to an alternative in the world of modeling compound: Bubber. A solid but fluffy and light modeling compound, Bubber is free of gluten, dust and allergens, as well as being non-toxic, leaves no stains or residue and it never dries out! 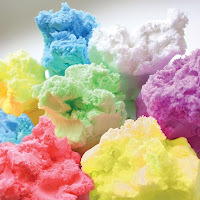 The soft, cloud-like texture can be molded into shapes but also breaks apart into smooth pieces... whether encouraging fine motor skills, building a castle or being used as a stress reliever, this unique product is fun for all ages. 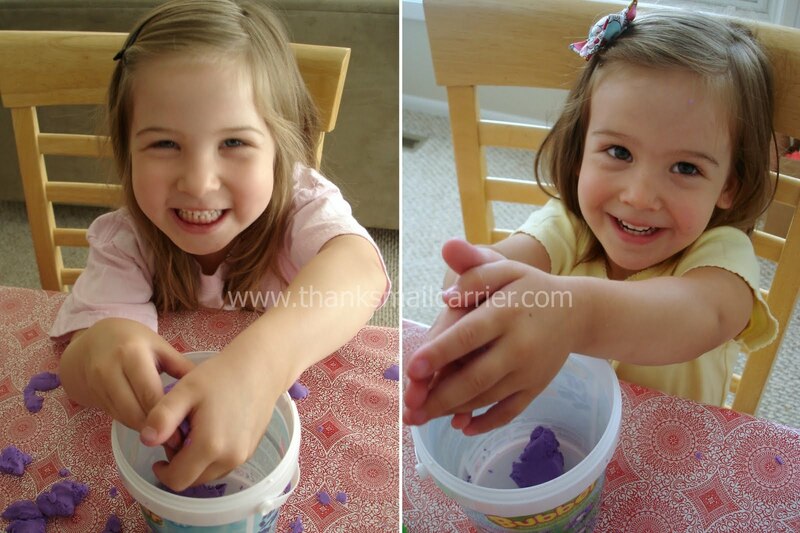 When our 5 oz Bubber Bucket in Petal Purple arrived, I knew that both of my girls were going to have a great time sculpting and squishing this unusual new product. 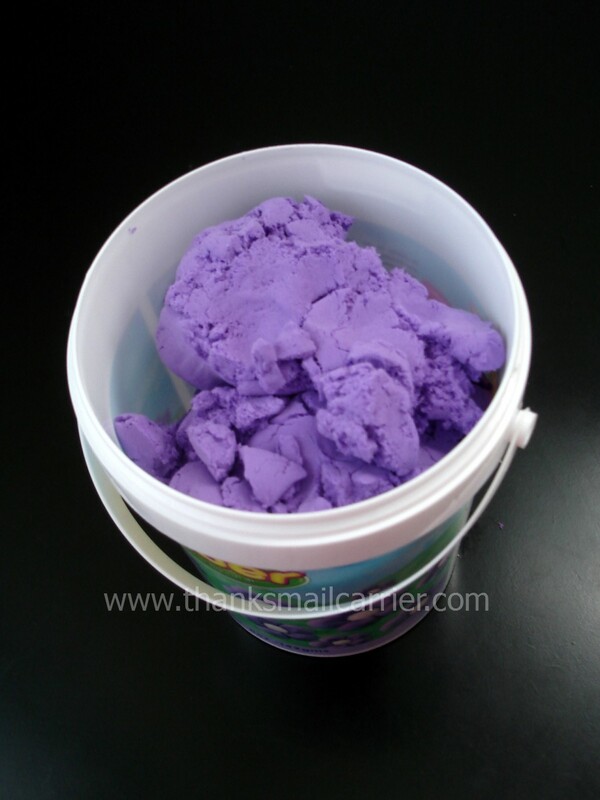 Considering that the bucket itself felt so light that it seemed empty, I wasn't surprised when we peered inside and what looked like a purple cloud of cotton candy was waiting for us. As soon as we touched the Bubber, we knew that it was unlike anything similar. It is lightweight and extremely soft and reminded me of discovering a luxuriously smooth spot in the sand at the beach (but not at all in a gritty way). While I was content to simply squish the Bubber in my hands and enjoy the feeling, the kids went right to work building and creating. ...and by pressing nearly anything into it, Bubber holds the imprint for even more fun! 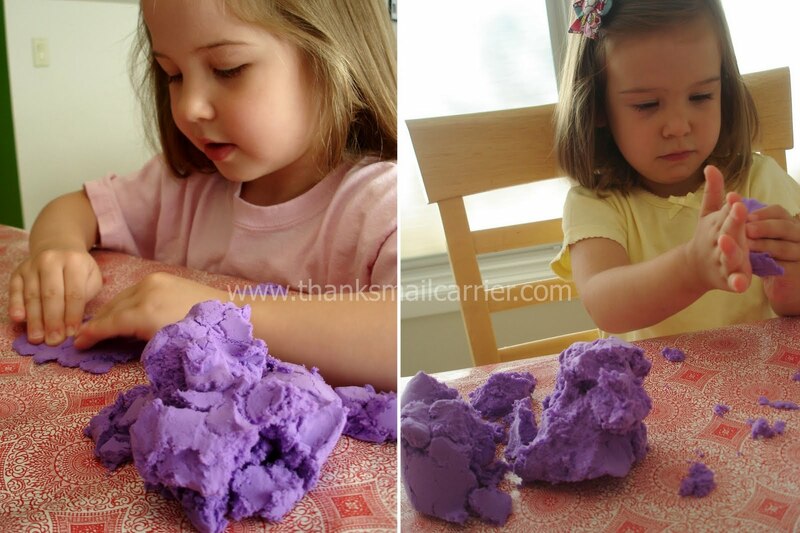 An instant hit since it arrived, the girls have played with Bubber over and over and each time it has provided a different and extremely entertaining experience. According to Big Sister E, "it feels like a really soft blanket but the inside looks like fur! It feels like it's sticking to my hands but it's really not!" Although not quite as eloquent, Little Sister B has said that, "I like it! Feels sticky but not sticky on it!" I take that as an agreement with the fact that I love how Bubber can stick to itself easily but doesn't actually adhere on my girls' hands or on surfaces at all. When we're done playing, we simply brush our hands together and any remnants fall right off and we can easily wipe any pieces from the table right back into the bucket. I love a toy that makes them happy to clean up! 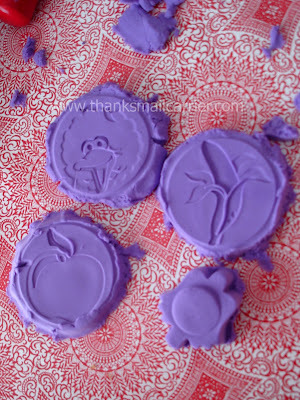 Even better, as this alternative to cold clay and messy dough (that continually has to be thrown away when it gets dry and hard) doesn't dry out, we're never worried about rushing every last morsel of Bubber into the container immediately. Instead, the girls can sculpt their creation, leave it out for lunch or to work on after nap time or the next day, and when they return it is just as good as new. The creativity and imagination is never stifled and never has to end! They've made everything from towers to food to snowmen and more... I'm never sure what the next idea will be thanks to Bubber. Available in six bright and beautiful colors in its portable, convenient container, the Bubber Bucket retails for $12.99 (there is also a 15 oz Bubber Box for $29.99) and is designed for ages 3 and up. However, with the safety and ease of use, I can see younger children having just as much fun with its marshallow-cloud-like texture and feel. How often do kids get to feel as though they are playing with a cloud? 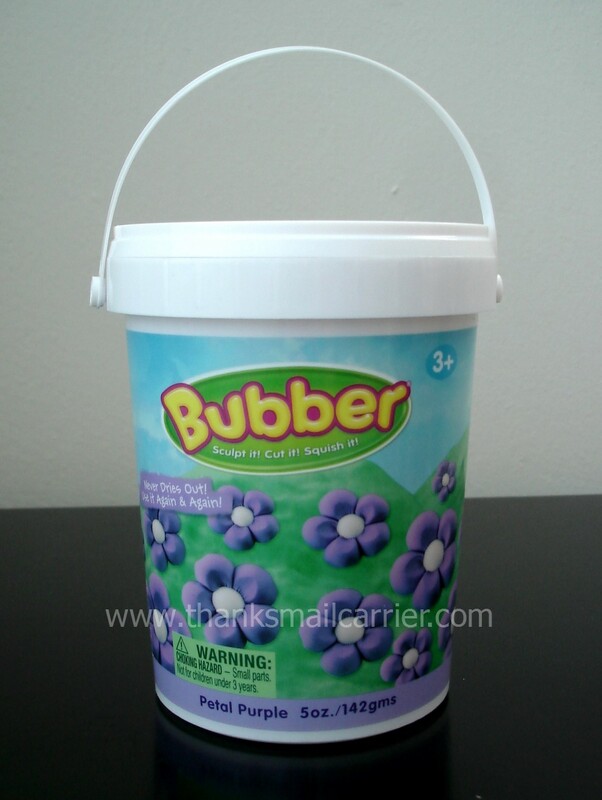 One lucky person will win a Bubber Bucket! 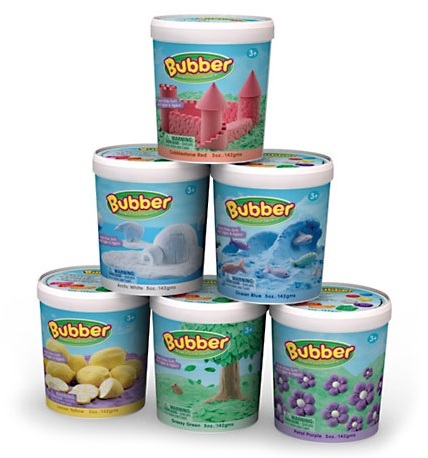 To enter to win: Visit WABA Fun and tell me one of the benefits of Bubber (for example: allergen free). 1 Extra Entry (per method) if you follow WABA Fun/Superstructs on Twitter and/or Like them on Facebook. A big thank you to WABA Fun for providing a Bubber Bucket me to review as well as for one lucky giveaway winner. The opinions shared are my own and honest and if you really need to see more, click here to see how I roll. Stain Free is the way to be...hehehehehe. Sorry had to. Yep, I love that it is stain free! I LOVE that it is easy to clean! It would be nice for my preschool classroom! I like WABA on FB! I entered your JiffyLube giveaway! Stain Free!! Gotta love that. How fun! I like that it's lightweight and never dries out! It says it's stain free. woo hoo! It is stain free so I don't have to worry about how to clean it up! BENEFIT IS: GLUTEN FREE!!! we are gluten free in my house! A Big Plus -- it's stain free. Doesn't stain or dry out! I like the different colores & LOVE that it never dries out! I'm a facebook fan of WABA Fun, LLC under username Jennie Tilson.